Disclaim! – Drop the Cow! Drop the Cow! is a product of the mind and experiences of pHil Rittenhouse, the author/cartoonist. Nothing more or less than that. Really. I, pHil Rittenhouse, work as a Senior Consultant for Microsoft Corporation. This is purely coincidence, and is stated here in the spirit of disclosure. Also, any resemblance to any persons living or not is… well, okay, it’s purely intentional, but only for humor’s sake. However, the views presented regarding work situations and management personnel are, strangely enough, not based on my current situation, but my many past (working) lives. I’ve been very fortunate to have a series of truly awesome managers at Microsoft, for which I am very grateful. At my previous employers, not so much. One last thing: Drop the Cow! will never release any confidential, secret, or otherwise valuable information on Microsoft’s products or practices. Won’t happen, so just stop looking for anything juicy and enjoy the comic. Or don’t enjoy it, but I really hope you will. Oh, one more last thing… As stated on the cartoon pages, LEGO® is a trademark of the LEGO Group, which does not sponsor, authorize or endorse this web site. 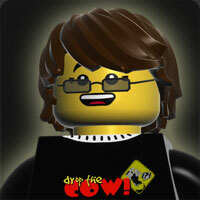 Visit the official LEGO website at www.LEGO.com and buy lots of LEGO bricks. I do.